Do you have some of our sleigh bedroom furniture in your home, or possibly some of our sleigh style bookshelves or sleigh storage benches? Well here is your opportunity to get yourself a matching entertainment center. 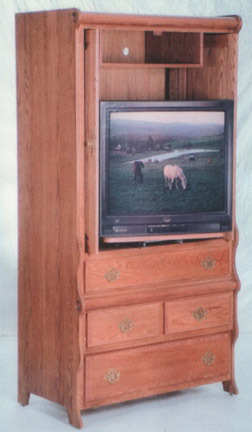 Designed to continue the sleigh theme you already have going, or begin it from scratch, the Amish make this entertainment center in both solid oak and cherry, and it is loaded with features. Of course you know it is a quality product that will last a very long time, because it features the top quality workmanship the Amish are famous for. Features 4 drawers - the top one has tape dividers. Sleigh style raised panel bed, dressers, night stands, lingerie cabinet, armoires, etc.